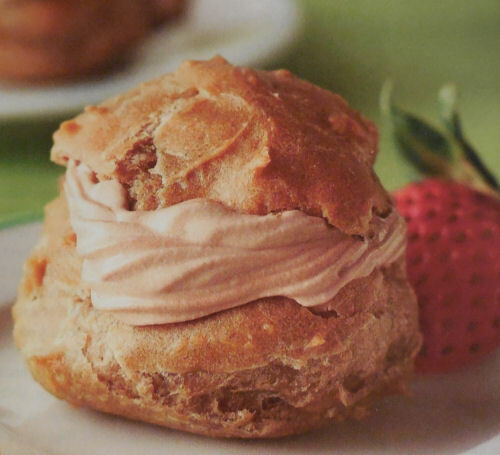 If you love the taste of coffee desserts, you will love these mocha cream puffs. They have a crisp top and bottom puff just brimming with delicious mocha cream that has been lightened up a bit. These delicious cream puffs make a nice light dessert and are great as a sweet choice of finger food the next time you have friends over for drinks. They are fancy looking but light and delicious too. The recipe calls for just a bit of butter and used low fat vanilla yogurt instead of cream to save on calories. Make your batter and them drop it on a baking sheet lined with parchment paper in 20 small rounds. Bake for 25 minutes until browned. The mocha filling is made with yogurt, cocoa powder and coffee crystals for a yummy taste that will tempt your coffee loving friends. For more healthy recipes, please visit The Gardening Cook Recipes on Facebook. These tasty cream puffs have a rich mocha center and a coffee flavored outside. Serve them for a special occasion. Preheat the oven to 400 degrees. Cover a large baking sheet with parchment paper. In a medium saucepan, combine the water, butter, coffee and salt. Bring to a boil. Add the flour and stir vigorously. Cook until a ball forms that does not separate. Cool for 5 minutes. Add the eggs, one at a time, beating well with each egg. Be sure it is very smooth. Drop onto the baking sheet in 20 small mounds. Bake about 25 minutes or until they have browned. Cool on a wire rack. When cool, split the puffs and remove the soft dough that is on the inside of the puff. Pipe the mocha filling into the bottom puff. Add the top and serve. To make the mocha filling, combine the yoghurt cocoa powder and coffee crystals. Add the whipped topping. Cover and chill until ready to use. These sound delicious — however the measurement for flour is missing for the puffs! 🙂 Thanks, I love your recipes!! Thanks for alerting me to my typo. I have edited the article so that it shows now. It’s 3/4 cup of all purpose flour. Proof reading is my friend! Hope they work out well.